Discover amazing tours through Southern Vietnam visiting places like Ho Chi Minh City and Hoi An. Most travellers enjoy exploring our Southern Vietnam trips in December, making it the most popular time of the year. 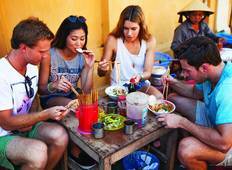 "This was my first Contiki (I have since done two more) and I could not have asked..."
"Amazing time in Vietnam, while the tour could have been improved. Specifically some..."
"To be honest, it took a few days for me to get into the groove of Vietnam. I felt..."
"Had the most amazing time on the Vietnam Highlights tour! Everything was planned..."
"We bought Scoopons for 10 day tour from South to North Vietnam. All organisation..."
"Sochea is a great guide with a awesome attitude and everyone got along really well...."
"The organisation of the tour was very good. All accommodations very brilliant, better..."